On Sunday, March 18, Montpelier Arts Center in Laurel, Maryland will celebrate Women's History Month by turning the spotlight on women in jazz with a free program entitled “Building Community” from 2:00 p.m. until 4:00 p.m. The event falls on the last day of the Washington Women in Jazz Festival which runs March 10-18 this year. The program features a panel discussion moderated by WPFW’s Katea Stitt and meant for women, men and teens. Professional musicians, community leaders, teachers, parents, students and jazz fans will have an opportunity to look behind the scenes to see how festivals and concert series have been built by leading female artists. They’ll get a realistic look at some of the challenges they faced in developing successful community backed events. Three acclaimed artists will serve on the panel. Currently living in Los Angeles, Amy K. Bormet is an in-demand pianist, vocalist, and composer. The quintet from her debut album, Striking, was featured as part of the Mary Lou Williams Jazz Festival at the Kennedy Center. An advocate for women musicians, Amy created the Washington Women in Jazz Festival in 2011 and serves as executive director. California native Jennifer Krupa is an active trombonist in the Washington, D.C. area. A member of the U. S. Navy Band Commodores Jazz Ensemble since 2004, Krupa also performs regularly with the Smithsonian Jazz Masterworks Orchestra, The DIVA Jazz Orchestra, and her own group, the Jen Krupa – Leigh Pilzer Quintet. Vocalist and bandleader Marianne Matheny-Katz is Baltimore City's most influential concert hostess. She is the founder of Jazzway 6004, one of the region’s most prominent jazz venues. She was a founding board member of Baltimore Jazz Alliance and an acclaimed artist. The late WEAA radio host John Tegler said, ""Marianne Matheny-Katz’s new CD, Somewhere in Paradise, comes as close to being perfect as any I have heard!" Along with Bormet and Krupa, Matheny-Katz will discuss the challenges and rewards of building community and generating support for female artists and events. They’ll address topics such as recruiting artists, securing venues, creating concerts, workshops, and jam sessions, and of bridging differences in age and demographics on and off the stage. Part of Montpelier’s “Jazz Talk” series, the Women in Jazz Panel Discussion was conceived Montpelier Arts Center Director Sonya Kitchens and Paula Phillips. 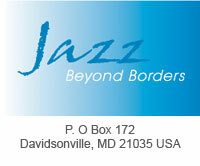 Phillips is the director of Jazz Beyond Borders and co-founder of the Maryland Summer Jazz festival, where she served as administrative director for over a decade.